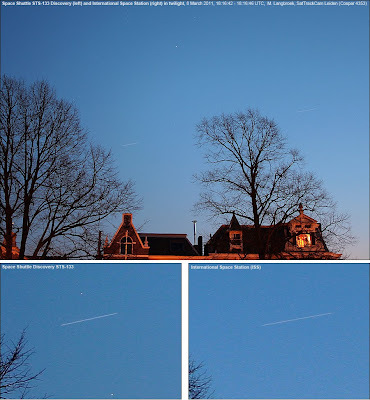 This evening in twilight (sun at -8 degrees altitude) we had a last pass of the "dynamic duo" Space Shuttle Discovery STS-133 and the International Space Station (ISS). After it's landing tomorrow late afternoon, Discovery will be retired. The two were well visible in a still bright blue sky, with Orion just visible. They sailed under Orion through Lepus, the Shuttle leading 37.4 seconds (about 19 degrees at culmination) in front of the ISS. Several other European observers reported a water-dump, visible as a "comet tail" behind the Shuttle. I didn't see it from Leiden though, likely because the sky was still too bright. greetings from cocoa beach florida,march 11 about eight minutes before the iss passed there was a large bright object traveling same path.